This exquisite bouquet made up of fifteen exotic and delicate sprays of Dendrobium Orchids, each spray bursting with vivid and beautifully colour harmonised blooms. This is nature on display at its very, very best. 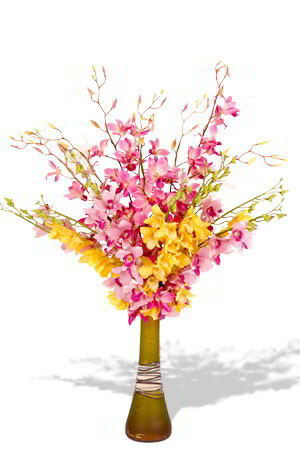 The vase in the picture is not included, but to personalise your gift, we recommend a Superior Vase as an ideal match for these beautiful Orchids. Beautiful flowers and quick and day delivery! Same day delivery as advertised! My fiancée was thrilled! :) Thanks! Thanks for your on time delivery of my order!. I've been using zFlowers.com for several years. I'm always informed via emails of birthday reminders and when order has been delivered. Great service.! ReadyFlowers reminded us - which was helpful as we couldn't remember which site we'd used last year. Ordering was easy and delivery prompt. Thank you for your quick service and making this gift special.